In the beginning of 1917, the Grand troubles in the Russian Empire lead to grief filled moments in world history. Until the beginning 20th century, Cossacks were free people who occupied the territory from the Don River to the pacific ocean,had it's own government, lived on their own Cossack land of what is known today as Southern Russia. Each Cossack region was organized from Hutars, to Stanitsas, to large Capitals. The Cossack people had an understanding of honor, kinship, the duty to protect their lands. In 1919 the newly established government in the revolutionized Russia announced to bring upon "Massive terror against all Cossack People”. Since then, millions of Cossack were brutally murdered, massacred, and forced to leave their free lands. An entire nation almost dispersed completely. 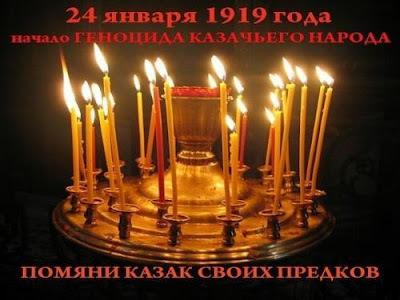 In today's world, the genocide still continues as the recognition of the Cossack Genocide, and the Cossack Nation it self, is denied in the very same home land of our ancestors once governed. We must all remember our ancestors, brothers, and sisters who laid down their lives for the Cossack Nation and we shall never forget the sacrifice they made, to preserve our identity, and our future.